Rooms with bathrooms. Room is equipped with: fridge, cordless kettle, LCD TV. On the premises parking lot. Additionally on the premises: place for grill. We offer: breakfasts. 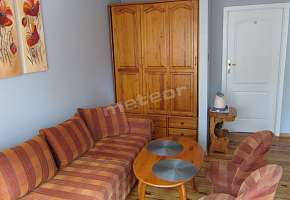 To the sea 150 m. Nice and friendly atmosphere, comfortable rooms guarantee perfect relaxation! Rooms with bathrooms. Rooms are equipped with: TV, radio. Apartments with kitchenettes. On the premises parking lot. In the vicinity canteen. To the beach 150 m. Quiet and calmness will make you return many a time! Some rooms with bathrooms. Apartments with: kitchenettes, bathrooms. Some rooms with bathrooms. Rooms are equipped with TV set. At disposal fully equipped kitchen. On the premises parking. Additionally on the premises place for grill. The object is located in the quiet surroundings. To the beach 300 m.